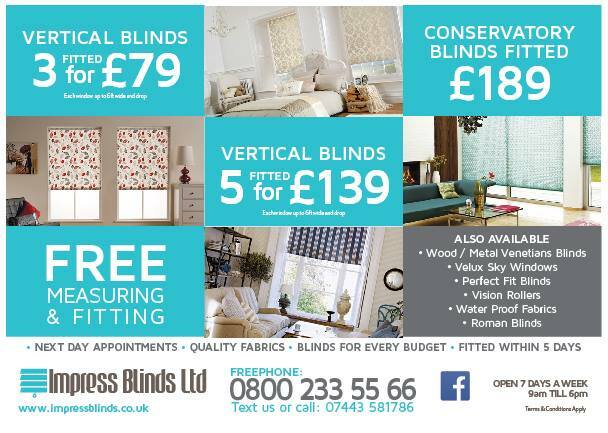 Do you need beautiful and functional Cheap Windows Blinds in Harrogate? You are at the right place. Impress Blinds brings to your town advanced windows blinds services that not only provide beautiful window coverings but also measure your windows and fit your blinds free of cost at any location in Harrogate. Whether you want to enjoy the beautiful printed and material designs when your windows are covered shut or you want to have fresh air and natural daylight flowing right through your house, commercial building or office building, our perfect and affordable windows blinds will provide you beautiful looks and unmatched functionality at all times. In Harrogate, Impress Blinds offers a large variety of windows blinds designs and materials. Our daylight maximizing majestic Vision Blinds suit offices and commercial buildings best and will provide adequate privacy, the beautiful and elegant Wooden Blinds and Conservatory Blinds are perfect for house interiors and fabric made Cheap Roman Blinds or beautifully printed and designed Custom Roller Blinds can provide that design and color theme that you have always been looking for. When you have wide windows, our perfect Vertical Blinds do the best job of covering them up beautifully enhancing privacy and easy open and shut mechanisms. Velux Blinds, Windows Shutters and Metal Venetians are also our superior quality product offerings made special with made to measure shapes and sizes with beautiful colors and printed themes. Not all windows are designed in similar designs. Some are more common with square or rectangle designs where others are more unique with curvy designs and old school measurements. Attic of loft windows are always shaped differently in the UK as well. Impress Blinds provides custom Made to Measure Blinds in all shapes, designs and sizes that can be made available for all windows in Harrogate. We have our very own windows blinds designing facility that ensures availability for all custom sizes, shapes and designs at all times. Gone are the days when you had to fix over the counter sold windows blinds on your oddly shaped windows sacrificing their functionality and designs, Impress Blinds is there to impress with our accurate designs and precise measurements. For regular people who are not too handy with measuring or fitting windows blinds, Impress Blinds offers unique free windows measurement and fitting services in Harrogate. Whenever you need windows blinds for your commercial, domestic or any other windows, we can send down a windows measuring expert who will take into account all your custom window requirements and order just the perfect blinds for your needs. Similarly, we will bring your ready windows blinds and install them efficiently placing all hooks and opening shutting mechanisms correctly leaving your windows look awesome, elegant and attractive. You will enjoy their boosted functionality for a long time while your windows look great for all that while.